GS Kids! Toddler Games is a free game for Windows 8 to make your kids learn about the basics of stuff like fruits, colors, etc. The game is designed specifically keeping kids in mind and when run on your device will present you with an interface which is pretty eye catchy and appealing to kids. The game is a collection of several mini games and makes for a great way to teach your kids basic things. The game is tablet as well as keyboard friendly and I definitely recommend giving it a shot. When run on your device, the game presents you with pretty and interesting main menu of the several mini games. You can click on any of the icons above to access that particular mini game. The screenshot below shows the Hanging Fruit game. 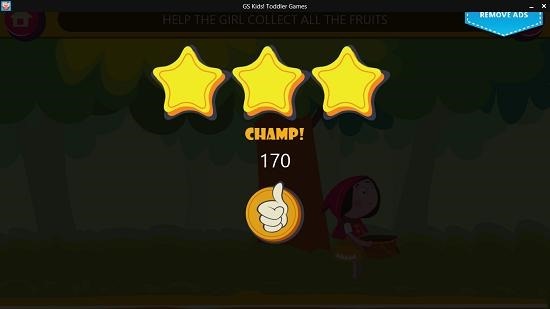 In this you have to click on the fruits hanging from the branches above so that the girl can run up to the fruits as they drop into her basket. Wait too long and the fruit will fall on the ground and it’s game over. You can see the Floating Bubbles game below. In this game you have to burst the bubbles to collect the vegetables and these will land in the girl’s basket. Each bubble that you burst will read out the name of the vegetable contained in that bubble aloud. You can similarly see the Hungry Frog game below. 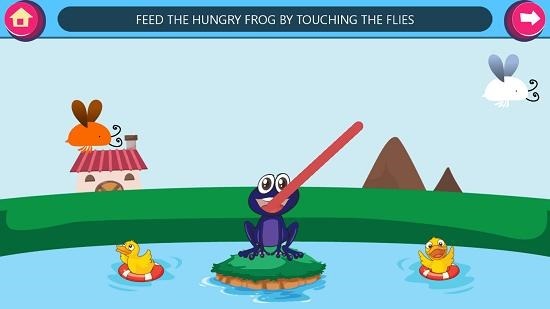 In this you have to feed the hungry frog food of different colors and each insect that is eaten, will spell out the color of the insect. Similarly there are other entertaining mini games in the app. Once you successfully complete a level you are given a star rating. GS Kids! 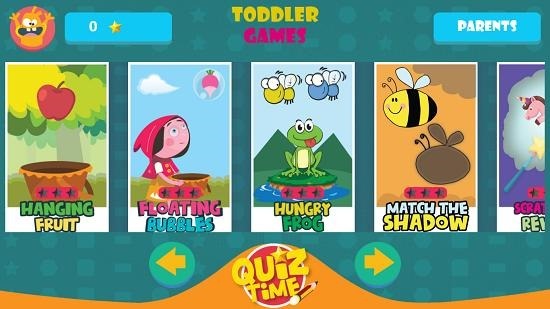 Toddler Games is a great app to keep your kids busy while allowing them to learn new things and have a lot of fun at the same time. You may grab the app from the link below. Get GS Kids! Toddler Games.